GBF have an Xsan-based shared storage workflow with our NLE tools and playout server. We very much wanted to go with a straightforward DAM, which would allow us to manage all of our videos, documents and graphics easily. We also wanted to make sure the system would be expandable later and provide enterprise-level functionality. Cantemo Portal offers all of that. From its headquarters in Seoul, the Gugak Broadcasting Foundation (GBF) delivers a rich and varied roster of programmes focused on the traditional Korean music from which it takes its name. With shows airing 24 hours a day, 7 days a week, the station provides a distinctive mix of traditional Korean music and contemporary fusion music, alongside cultural news, live concerts, interviews and educational content. The central aim of GBF is to “reflect diverse aspects of Korean music and culture.” Popularity within Korea has seen the station grow to a nationwide organisation with 80 employees. GBF is currently leveraging digital technologies to widen its service and introduce a global audience to this unique aspect of Korea’s heritage. In addition to the established radio broadcasts, the station currently provides an online stream of video content. Generating all of that content week after week, year after year has meant that GBF are now in possession of an expansive library of digital video, audio and graphic files. The current SAN has grown beyond 250 terabytes and as other organisations have discovered, the benefits of an expansive shared storage pool can be reduced without a dedicated asset management solution. In GBF’s case this job is now fulfilled by Cantemo Portal™. When the team at GBF first started work on this project they sat down with integration partners, toolsmedia, to define the key requirements of the ideal digital asset management system. They determined that first and foremost the solution must be easy to use. It also needed to be affordable and provide the opportunity to grow along with the station. The simple elegance and robust foundation of Portal impressed everyone and it was deemed a natural fit. Particularly attractive to GBF was Portal’s best-in-class, browser-based interface. For the end user it makes asset management no more challenging than navigating a modern web site. The ability to deploy Portal for small workgroups meant the station could move forward without the burden of a large commitment. Yet, the enterprise-class pedigree of the software, including features like load balancing and high-availability, provided confidence that Portal would be able to accommodate the demands of a much larger future deployment. Integration with Apple Final Cut Pro 7 and Tools On Air just: play, as well as support for Quantum StorNext were almost bonuses that made the choice emphatically clear. With Portal in place, anyone within the organisation can search, browse and preview the collected assets directly in a web browser. The HTML5 interface renders in every modern browser no matter the device and without the need for third-party tools or plugins. The flexibility of the design also means custom metadata can be rendered in Korean. All of this combines to create a library for everyday use and provides new opportunities for programme makers. The introduction of Portal has enabled us to marry major technologies from four independent vendors: Cantemo, Apple, Tools On Air and Quantum, to create a fully integrated solution. While much GBF’s output may be focused on tradition, the post-production workflow toolsmedia devised is anything but. The modular application framework in Portal means the core software can be augmented to provide additional functionality that is tailored to the specific needs of an organisation. With the Annotation Tool, the production team at GBF can add time based metadata to clips. These are transformed into extended markers when sent to Final Cut Pro. 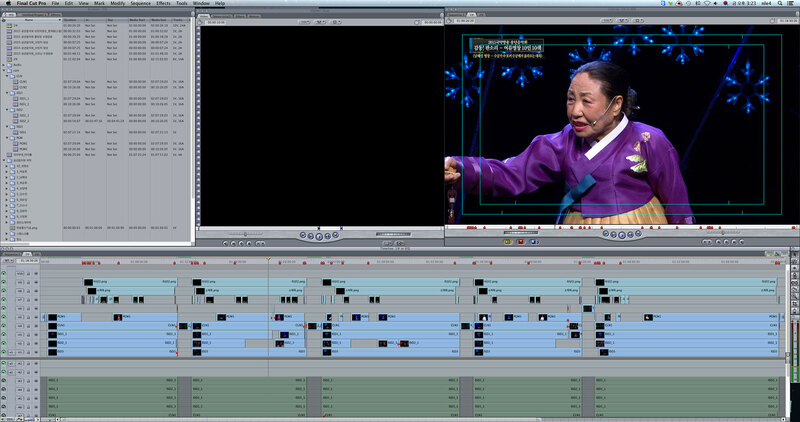 They can also use the Rough Cut Editor to create sequences and open edited clips in FCP for further work. The powerful search tools reduce the time spent hunting through bins for footage. Items can be added to the user’s own MediaBin for later reference or saved to a collection and given to a colleague. When the editors are ready to move to Final Cut Pro, clips and sequences open in an instant because the NLE and Portal share the same storage. All of these features provide editors an opportunity to work more efficiently and focus on creative tasks rather than technical processes. The value to the production team of having the entire content library at their fingertips should not be undervalued. Past shows or important historical moments are a quick search away. Footage can be recut and repurposed to create new content. In so doing the station has not only provided new creative possibilities, but also increased the value and relevance of the historical programmes. Just as GBF offers fresh context for the oldest Korean traditions, the production team are able to bring new life to the archive. While working to promote the traditional music of Korea, The Gugak Broadcasting Foundation has produced its own body of important work. When we began this process we were certain there was potential to be realised in the archive and wanted to build a solution that promoted that legacy. With Portal we have found a solution that provides the editors with access to all of the media the station has ever created and achieved our goal. As the new workflow took shape GBF had one more very specific request: Could Portal export files ready for their just: play playout system and the web streaming server? The solution required some custom development, but Portal has been designed with an open infrastructure specifically to facilitate this kind of extended functionality. The solution, which loosely translated, is referred to internally as “the changeable name option for exporting,” means Portal is now a fully integrated part of the post-production pipeline, connecting each step of the process from ingest to delivery. It’s not easy to develop an asset management solution internally, let alone one that includes the innovations you find in Portal. When GBF had specific feature requests Cantemo, together with toolsmedia, were able to work directly with the client to build a custom solution and accommodate unique workflow requirements. With the first phase of the project complete, GBF and toolsmedia are already planning what they can do next. The station is committed to expanding its service and is aiming to launch a dedicated television channel in the near future. This means more editing stations creating more content. All of that footage has to originate somewhere and the success of the Tools On Air software for playout has created interest in the opportunities afforded by the just: in multi-stream ingest solution. GBF already know Portal will effortlessly accommodate more users and more media. The partnership between Tools On Air and Cantemo® means the integration between just: in and Portal is already in place. The GBF team feel confident the extensible nature of Portal is in line with this objective and will enable them to achieve their goals. Whatever the final direction, traditions will be passed on and future innovations assured.